I just wanted to share with you a recent event I attended. 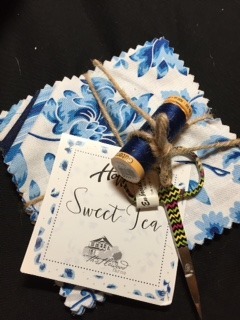 A few days ago my quilting friend and I took a short road trip over to Mill House Quilts in Waunakee, WI, for their special event featuring KariAnne Wood called “Sweet Tea Fabric Designing & Home Décor Party”. KariAnne Wood designs fabric for Hoffman Fabrics and writes a very successful decorating & lifestyle blog: Thistlewood Farms. She’s been featured in Better Homes & Gardens Magazine, Country Living, Country Woman, HGTV Magazine to name a just a few. And her work has been featured on several TV programs, such as “Tiny House Nation”. I expected to learn something about her new line (which we did), and maybe a thing or two about the process of how she designs her fabrics (which we also did). But what I didn’t expect was to be delightfully entertained and literally “in stitches” laughing for over an hour. She was wonderful. 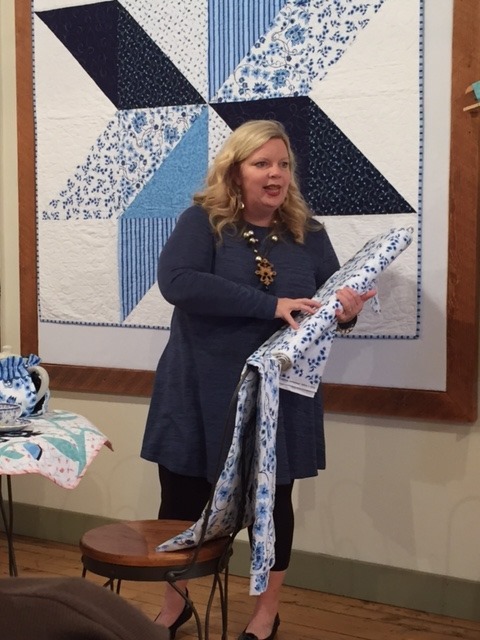 KariAnne not only showed us all of her newest fabrics, but had on display dozens of ideas of ways in which to use her fabrics–not just in our quilts, but also in our homes. She talked about aprons, napkins, tablecloths, chair covers, pillows…the list of ideas went on and on. At the end of her lecture, we were each treated to a sweet charm pack of her fabrics including a spool of thread and an embroidery scissors! So sweet! Thank you KariAnne! So if you’re lucky enough to have KariAnne come to your area, be sure to go on a road trip to see her. You’ll thoroughly enjoy her! I only wish I had taken more photos of the beautiful sample items she had on display to share with you. If you’re interested, you can check out some more photos on Mill House Quilts FACEBOOK PAGE HERE. (see their mid-October posts). This entry was posted in Quilting Road Trips and tagged Designing Fabric, Hoffmann, KariAnne Wood, Mill House Quilts, quilting fabrics, Special Quilter Lecture Event, Sweet Tea Fabrics, Thistlewood Farms. Bookmark the permalink.